On the final day of this year's Lent Bumps, KCBC had a very successful day, with bumps for M1 and M2, and row-overs for W1 and W2. Well done to all crews who took part, from both King's and the other colleges, and especially to those who competed in Bumps for the first time! Having made a name for themselves in both Mays 2018 and Lents 2019, our first men's boat end the week in 12th position, coincidentally the same position they will be starting Mays next term. 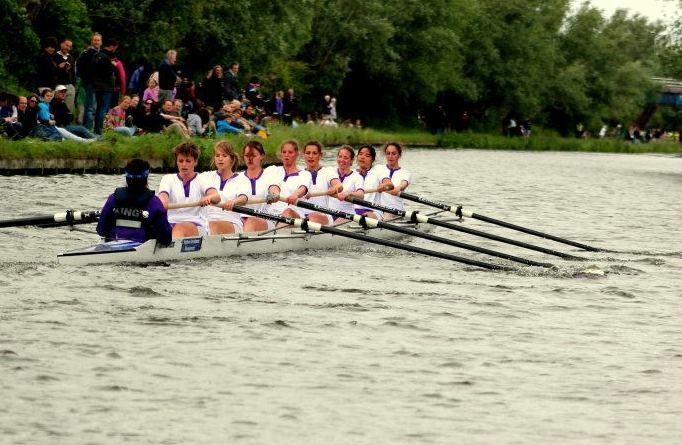 The first women's boat end the week at the top of the second division, one above their start position next term. After a frustrating Friday for M1, we were all focused on delivering our best performance on the final day of Bumps to round off a successful campaign. We began the week at 17th position on the river, but knew that bumping Clare on the final day would give us a finishing position of 12th. We were being chased by Magdalene. They are regarded as a fast boat, but we had shown earlier in the week that we could walk away from them and were confident that a good row from us would ensure we would walk away again and bump Clare. We had a very good warm-up and our practice start was the best we had delivered all term. We finished the row down to the start and awaited the four-minute canon. The start canon boomed and we got away fast. Calls from the bank told us we were MOOVINGGG. We came out of our start sequence and found our rhythm coming through the railway bridge. Our attack was rewarded with our first whistle. By this point, we were outside station from Magdalene, and could relax and turn our focus solely to bumping Clare. The whistles kept coming and we showed no signs of making it a slog. We bumped Clare before first post corner. It was the perfect end to a great campaign. Having experienced being bumped, bumping and several rowovers we were determined to gain during Saturdays racing. As sandwich boat being chased by Peterhouse we knew we’d have it tough. But the whistle blows from their coach never lasted long as we consistently pulled away, leaving Darwin to bump them out. To try to break into div 1 we agreed that we’d step it all out in the first two minutes - a tactic that was working as a solid start resulted in a length whistle. This 2 minutes turned to 10 as Queens managed to keep their distance for the rest of the piece. But we finished with our heads held high, defending our position at the top of div 2. We started the day as the M4/M3 sandwich boat, so we had to row twice, which we did very well by walking away from Wolfson II, but we were scared going into the final race of bumps, so we worked hard and got a bump on Peterhouse II at Ditton Corner, and now we are happy. It was the last day and therefore the last attempt for W2 to avoid SuperSpoons. Tensions were high. The row down involved weather from all four seasons - there was a whole lot of wind, some rain with intermittent periods of sunshine. We set off down to the lock to start the race. The 4 minute canon went off followed in no time at all by the 1 minute canon. We set off and had a good start pulling away from Clare Hall W1 behind us. We maintained the distance for a while until they started closing in on us on the reach down to first post corner. We were a three boat sandwich with Emma W3 on the heels of Clare Hall W1. At this point William Connolly decided he wanted in on the action and got on his bike to follow us down. Charles (our cox) took a glorious line round first post corner which meant we were able to push away from Clare Hall who took a much wider line. Emma then soared in with an equally glorious line, bumping Clare Hall. The cheers were abundant... most of which seemed to be coming from the Kings W2 boat who had fought off the SuperSpoons and could now look at getting Newnham W3 back for their bump on us yesterday. We pushed on and rowed hard all the way down to the reach. Newnham W3 in front of us then caught a crab and our bank party were besides themselves telling us to go and catch them at their moment of weakness. We closed in. There was a whistle. There was one boat length distance between us. Spurred on by the shouts of people on the bank (our bank parties had doubled in size at this point as more people decided to follow the action) Newnham managed to pull away and we continued to the finish line... or what we thought was the finish line. Our bank party quickly spurred us on to the correct finish line. We crossed it and erupted into great celebration at our row over. The M3 boats marshalling at the P&E had seemed slightly confused at such celebration for what appeared to be an average rowover. Little did they know we had just won our long hard fight against SuperSpoons! Past the half-way point of this year's Lents, Friday saw row-overs from M1, W1 and M2, and W2 bumped by Newnham III. Day 3 of Bumps for M1 has been another dramatic one. Today we were chasing Trinity Hall, who were chasing Clare. 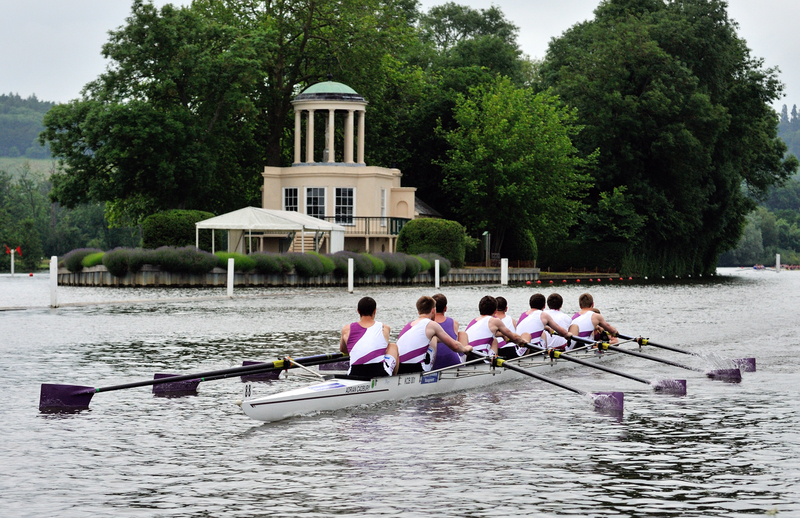 After seeing Queens' gain on Trinity Hall off the start yesterday, we were confident that we could catch Trinity Hall. The big question was – could we catch Trinity Hall before they caught Clare? As the four minute cannon fired, the rain began to fall heavily and the wind picked up. Station 13 gave us a straight line to First Post Corner, and we intended to capitalise on it. After a solid start we hit a strong rhythm coming into the Motorway Bridge. About halfway up First Post Reach we got our first whistle – we were moving on Trinity Hall. Coming into First Post Corner we started getting two whistles, but we could also sense that Trinity Hall were gaining rapidly on Clare. The water became very choppy. Vicky steered us safely through the carnage in the Gut, skilfully avoiding Peterhouse (whose stern blocked the racing line into Grassy Corner). As we came out of the corner, we heard calls from the bank saying that we had to go now, before Trinity Hall finished off Clare. We lifted and got to within 1/4 of a length when we were told to hold it up. Trinity Hall had bumped Clare. We were given a technical row-over. It was not the result we had hoped for, but it was still a good race between three good crews. It was all the more thrilling for the spectators at the Plough, who got to see the final few strokes unfold in front of their eyes. We had a determined row back to the Boathouse, closely followed by Magdalene. The unsavoury comments from their bank party will help to spur us on tomorrow, away from them and, hopefully, into Clare. We did it on Day 2, we can do it again. Following a successful second day of racing, W1 were back on the water and ready to take on another day of bumps, in far better weather than the previous day. As sandwich boat, our aim was once again to row over, hopefully this time without getting caught. We had every confidence that this would be the case, and indeed it was: a successful row over at the top of Division 2 put us at the bottom of Division 1 to chase Queens’. We didn’t catch them despite a strong row over, but overall we were in a good position to take on the final day of bumps. Going into Friday’s race, W2 were fully focused and determined to change our luck. We pushed out on a bright afternoon and had a clear racing line for our strong start, which pushed us away from Newnham behind. We could see Clare Hall gaining on Newnham, and were fairly confident that we’d be rowing over (or trying to catch Darwin), when the first of two disasters struck: another boat that had cleared was blown back onto the course and forced us to put on the rudder to avoid a crash. Some brilliant coxing by Charles kept us clear of the boat, but we lost some of the distance we’d opened up on Newnham. We struggled to regain our composure and Clare Hall fell away from Newnham, freeing Newnham to start walking up on us. Although we fought to avoid the bump, holding Newnham away from the overlap and not conceding until the bump looked certain, W2 did sadly go down in the rankings today. We sprang back by belting out ABBA songs all the way home, and are ready to take on bumps again tomorrow! W2 remaining cheerful on their row home, after being bumped on Thursday. In conditions far better than yesterday, the M2 crew were excited to push Queens' M3 back into the division they belonged, but Queens' caught Peterhouse M2 and we rowed over. 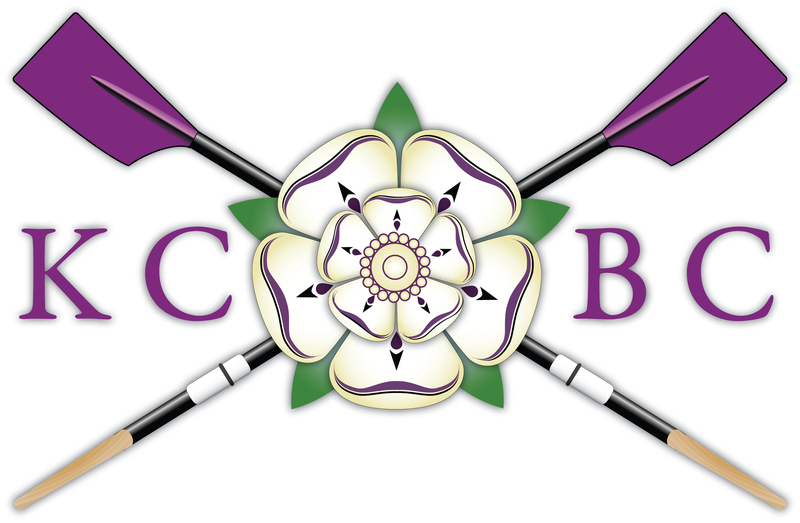 After a mixed start to KCBC's bumps campaign, Thursday set things firmly back on track, with bumps by both of our first boats, a row-over by M2 and a day off for W2. After a day off the water, W1 were back and ready fight, with only two options: bump or be bumped. When the cannon went for Division 2, W1 were off like a rocket (despite a slightly shaky start), and almost immediately the horn sounded, telling us that we were a length off Lucy Cavendish. From then on it was a mix of adrenaline-fuelled power and exemplar coxing that allowed us to bump in no time, although Lucy Cavendish’s unwillingness to concede led to a rather aggressive bump. Immediately after racing in division two came our first division race, with us once again facing Fitz, although now we were chasing them instead of the other way around. After a rather monumental crab, which was very nicely recovered from, we rowed over the whole course, through somewhat biblical weather, and more than anything we were glad to get back into the warm and dry, with the added bonus of having restored our glorious sandwichy status. 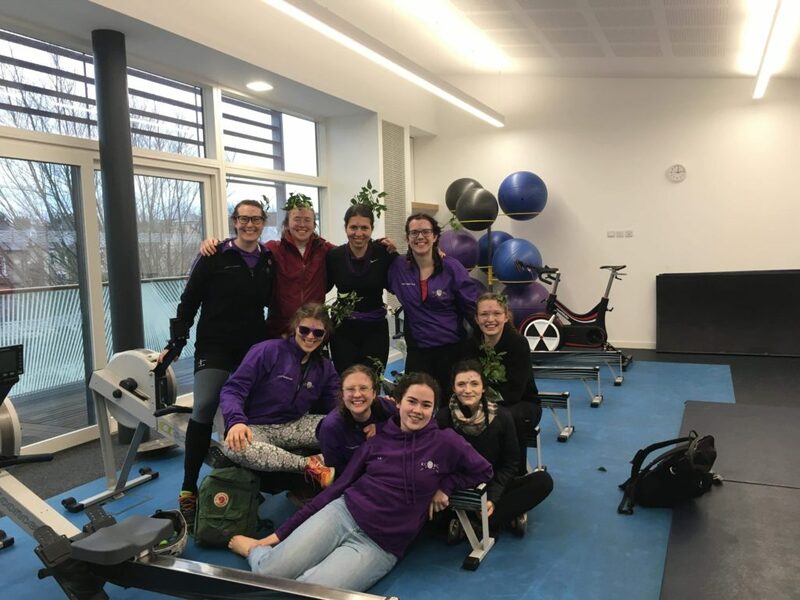 The overbump on the first day of racing had given us confidence that we could have a strong campaign, but we knew that the second day of racing was important; we were either bumping Queens' or getting bumped by a fast Magdalene crew. Horrible windy and wet conditions added to the theatre of the day. The canon fired and first division was off. We had an OK start, but never found the strong and sustainable rhythm that we had work so hard on all term. Magdalene were closing gradually but coming up first post reach we began to get whistles to signal were closing on Queens’. Coming around first post we had overlap, but calls from the bank told us to hold it up. A blocked river lay ahead after some boats failed to clear. A re-row was called, so we spun around and rowed back down to our station. The canons fired again, and we were off for a second time. We had a much more controlled start, and stepped onto a far more relaxed and long rhythm. From this rhythm, we got what we deserved. We pulled away from Magdalene coming up first post reach and were fast closing in on Queens’. We knew they would break eventually and an excellent line coming around first post corner ensured the bump. We come back tomorrow, hungry for a another one. We started feeling sad after yesterday and didn't want to get bumped again, but we rowed really hard despite the awful conditions and managed to secure a juicy row over. After a disappointing start yesterday, M1, M2, and W2 took to the water, aiming to make up for yesterday's bumps. W1 had their rest day today, and will return to the river tomorrow, hoping to regain their position in the first division after an unfortunate start to their campaign. M1 rowed last, surrounded by fast crews, chasing Magdalene and being chased by Emmanuel, at station 17 in the first division. After a shaky start off the gun, we recovered quickly, hitting rate 45 off our lengthens and moving onto a strong, sustainable rhythm. As we came under the A14 bridge, it became apparent that Magdalene were going to catch Churchill ahead of them, leaving us with the prospect of overbumping Girton if we were to avoid rowing over the whole course. We were confident it could be done, and soon shouts from the bank told us that we were four lengths away from Girton. To the pleasant surprise of the crew, the gap shortly became three lengths, then two, reaching inside station shortly before first post corner, leading to the first over-bump in the Men's first division since 2010 on the apex of first post corner. As a result, M1 has moved up to 14th in the first division, looking forward to chasing Queens' tomorrow afternoon and relishing the challenge of pushing away from a strong Magdalene crew. 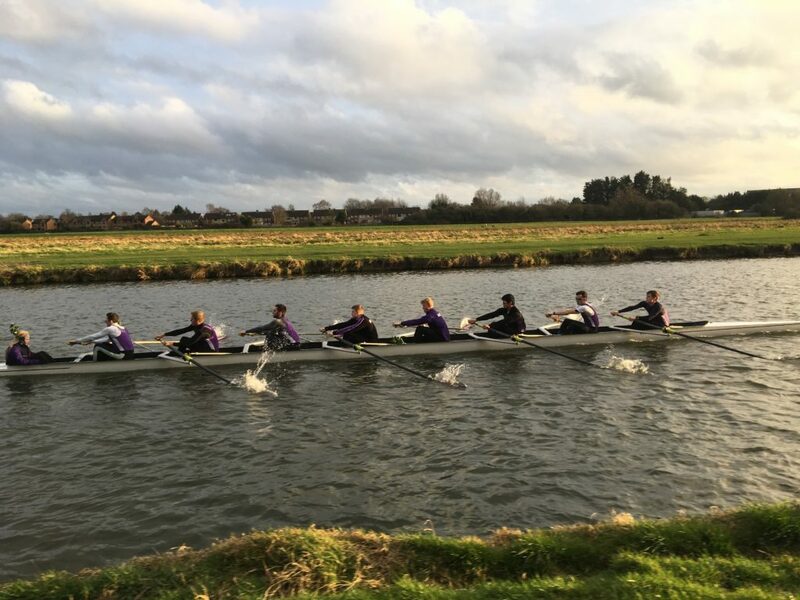 After a mediocre day on Tuesday, King’s M2 was adamant to show a good result by rowing over ahead of Queens’ M3, but with a somewhat rushed start and worsening conditions past the motorway bridge, the Queens’ crew was able to capitalise. They received a whistle slightly before first post corner, and then made contact with our stern shortly after. After a somewhat disappointing start on Tuesday, W2 were back and raring to go for day two of bumps. Being chased by our long-standing nemeses, Darwin, we knew this race was going to be a tough one. We had a great start and soon settled into a nice strong pace. We were even gaining on Medwards! Alas, it wasn’t enough: Darwin got one whistle, then two, and despite some great ‘lift’ calls from Charles they soon caught us. We may have taken a hit, but we’ll be back on Friday ready to bump! 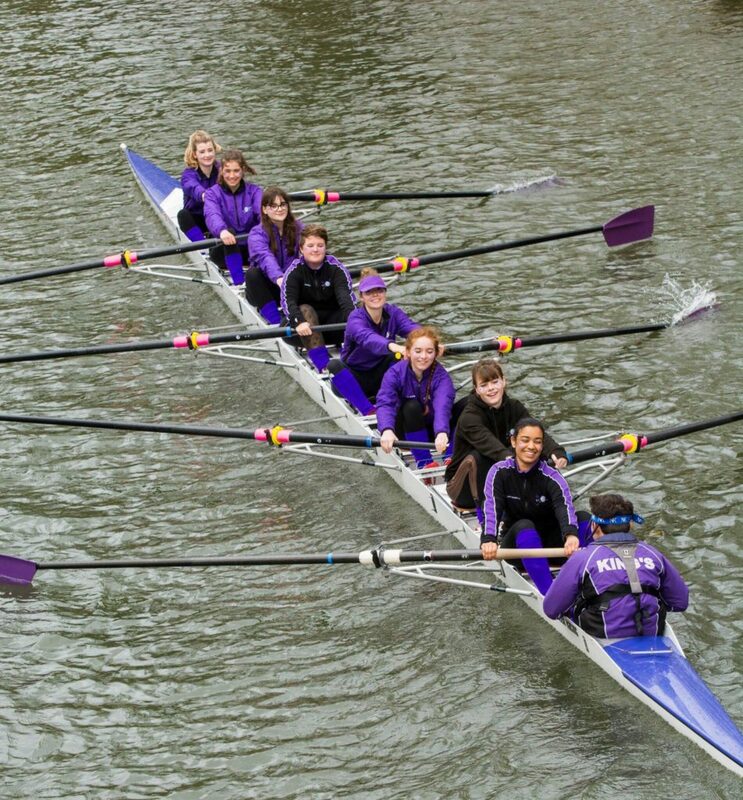 Kitted out with matching sunglasses and purple war paint, King’s W1, the majority of whom had never actually done bumps before, were ready to take on the Cam and row over in glorious fashion (rumour has it that if you all have co-ordinating kit on you get a second off your split). After what seemed like an age, and a couple of questionable renditions of Total Eclipse of the Heart, we were ready to row up to our station and row over the whole course. However, this was not to be: out of nowhere, Fitz were on us, and although we held our own for a fair while, they caught us, and we had to concede, but not before our stroke’s rigger came down on their bow and carved a nice little line out of it. Overall, although it wasn’t the result we’d hoped for, W1 proved that we were ready to fight, and the next days of bumps should be, at the very least, very exciting. The first day of W2s bumps campaign didn’t exactly go to plan. The last boat to arrive at marshalling (the crew had been distracted by our flashy new leg warmers and “festival style” war paint), the girls thought they could pull it off. Someone on bumpit had even gone so far to predict W2, or colloquially KCBABESC, would DOUBLE OVERBUMP on St Edmunds W1. The crew was hyped rowing towards the start. The practice start fast. And then the wait. The cannons. The first stroke. The start was snappy and fast, W2 were gaining on Queens W2, Murray Edwards trailing behind. And then, crab. The boat was rocked. The recovery wasn’t happening. Medwards were gaining but alas, they conceded. Their cox’s hand shot up for a minuscule second, so fast that neither cox, bank party or Marshall noticed. W2 were still loosing speed with chaos amongst those that could still row. The Medwards boat was clearing and as their bowball passed the Kings cox, Kings W2 conceded and pulled into the bank, unaware of the tragedy that was to follow when Trinity Hall W2 continued past, overbumping W2, in the most unlucky of ways. We chatted a lot about our ability to quickly bump Peterhouse II, but were sadly but squarely beaten by a very fast Caius III, which rumour has it is their first postgrad boat.